Following recent publicity and commentary on mountain hare culling, Douglas McAdam, chief executive of Scottish Land & Estates, wrote this article for today’s Sunday Herald. Culling is a word that conjures up all sorts of images and, for most people, none of them very attractive. The mere mention of a seal, badger or even deer cull – perhaps the most emotive examples – understandably unleashes passionate debate. Environment, on the other hand, is a word we are all much more comfortable with. We all know the need and benefits of protecting and nurturing the environment. So can culling and environment be reconciled? 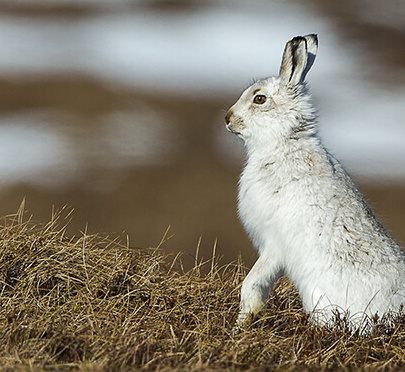 Concern has been expressed recently about the practice of culling mountain hares – understandable given recent coverage in print and social media. Criticism of culls is often made as a result of the basic misunderstanding that if hares are being culled, the population is therefore being wiped out. Some people, given the information in front of them, may accept that view at face value – but it would not be an accurate conclusion. Mountain hares are not being wiped out – far from it. We also have to be careful of double standards. Conservation bodies will support a drastic cull of red deer to reduce grazing pressure (leaving the carcasses to rot on the hill) yet will take another stance entirely on mountain hares. Mountain hare populations move in cycles and they have always been managed by periodic culling when numbers are high. This is still done for the purpose of keeping numbers at a sustainable level, as hares can affect fragile habitats through grazing pressure, can spread sheep tick which also affects red grouse, and can cause the failure of tree-planting schemes. When the population is at a lower point in the cycle, no culling is carried out. Hare populations also fluctuate geographically, so culls are localised. In recent years, the number of hares in parts of the Cairngorms have risen considerably and to levels that have driven the need for properly organised and humane culls. Culls are legal and recognised as being necessary by a range of conservation bodies including the Scottish Government’s nature organisation, Scottish Natural Heritage. There is also a duty on estates to prevent grazing pressure on rare flora such as juniper and habitats on Sites of Special Scientific Interest. Estate businesses would be negligent if they ignored such responsibilities. There is, however, controversy and concern over the scale of culling. There is a protocol in existence between Scottish Land & Estates, which represents estate businesses, the Scottish Game and Wildlife Trust and SNH which states that restraint should be exercised on the scale of culling to ensure that populations can rebuild. Grouse moors, due to the way they are managed, are the best reservoirs and producers of mountain hares anywhere in the country. But the flip side of that is that they then need to be managed periodically as the population climbs to prevent overgrazing and disease problems. Moorland keepers have long experience of managing hares and use a variety of methods of assessing numbers and therefore the appropriate level of sustainable cull. Culls typically reduce the population by 10-20% and the most efficient and humane method is by shooting. Culling of hares is not a frequent practice. Essentially, management of hares by culling in this way is no different to managing deer or rabbits. Some conservation bodies and private estates organise large culls of native red deer (Scotland’s most iconic mammal) to reduce their deer numbers to near zero to encourage regeneration and ongoing protection of trees and scrub growth. There is also constant debate over the scale of deer culling but there is no question that sustainable deer management is necessary. Moorland managers cull mountain hares to maintain the population at a sustainable level and to conserve the open heather habitat. Voluntary restraint is exercised. There is no point in culling hares, or indeed any desire to, if there could be any risk to their conservation status. The most difficult aspect of this debate for moorland managers is that they see the reality on the ground and believe firmly that conservation is a key element of their professional duties. Those of us involved in this work also have a duty to inform the public why this is necessary and that it is being done humanely and correctly. If you go to the Cairngorms today, you will find mountain hares in abundance and living proof that culling and environmental benefit do have a place together in the heather clad hills. ESTATES AND GAMEKEEPERS: HEATHER ON FIREOK!